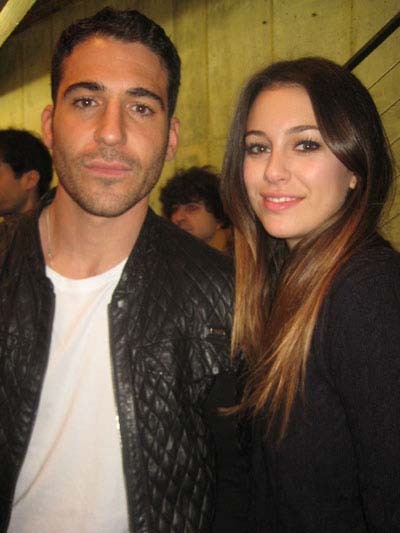 12-07-12 (L-R) Film actors Miguel Angel Silvestre and Blanca Suarez at a press conference for Spanish Cinema Now at the Instituto Ceravntes. 211 East 49th St.
12-05-12 (L-R) Cast members Edwin Cahill. Gardner Reed. 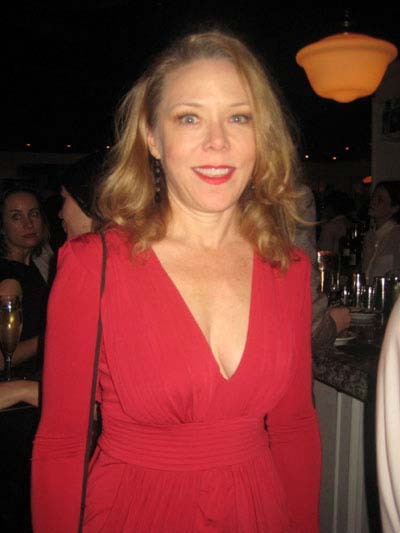 guest Karen Ziemba. director Andy Sandberg at the opening night party for "Zelda at the Oasis" at Bourbon Street Bar and Grille. 346 West 46th St.
12-05-12 (L-R) Katie Holmes. Chita Rivera. Ricky Martin present the awards at the 24th Gypsy of the Year at the New Amsterdam Theatre. 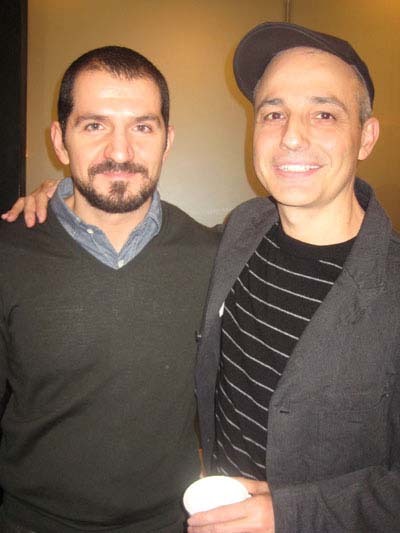 214 West 42nd St.
12-07-12 (L-R) Filmmakers Jorge Torregrossa (L) and Pablo Berger at a press conference for Spanish Cinema Now at the Instituto Ceravntes. 211 East 49th St.
On Broadway. The Anarchist, by David Mamet, has two wonderful actresses, Patti LuPone and Debra Winger in her Broadway debut, locked in a discussion by a jailed inmate with a prison officer pleading for parole after 35 years . It only lasts 75 minutes, but, unfortunately, seems longer. The opening night party took place at Redeye Grill, with guests like Richard Thomas, James Earl Jones and Tommy Tune. 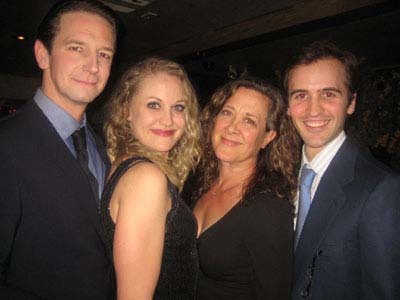 Off-Broadway, Zelda at the Oasis, by P. H. Lin, is a two character play about a drunken Zelda Fitzgerald (Gardner Reed) in a bar of the title, reminiscing about her life with the bartender (Edwin Cahill), who plays multiple roles when she recreates scenes from her past. The opening night party took place at Bourbon Street Bar & Grille. 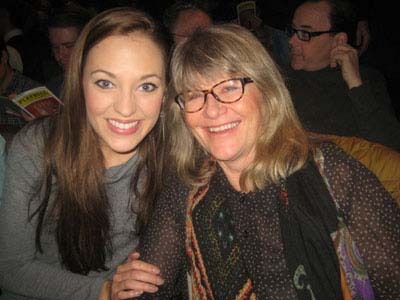 A Civil War Christmas, by Paula Vogel, is an intelligent holiday pageant about real people (Abraham Lincoln) mixed with fictitious characters on Christmas 1864, The large cast is excellent and the play features songs of the period. A revival of Volpone, by Ben Jonson, will open on Sunday. I will write my comments in the next column. 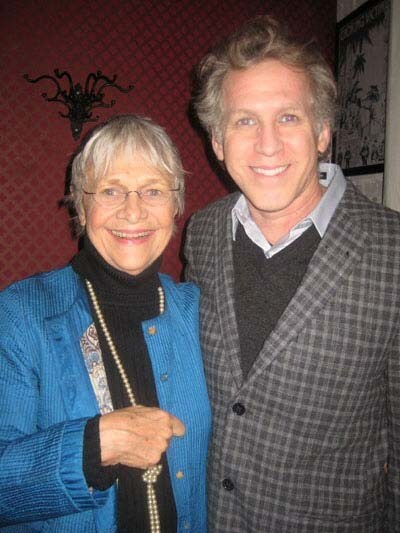 The benefit gala took place at Spasso with guests Estelle Parsons, Kathryn Meisle and Michael Emerson. The Last Seder, by Jennifer Maisel, is about four sisters (one played by Gaby Hoffmann) returning home to spend the last seder with their father (Greg Mullavey) suffering from Alzheimer's Disease. All four have too many personal problems for this slender play. The opening night party took place in the theatre. The Irish Repertory Theatre presented a lovely concert by award winning Irish composer Phil Coulter, The Songs I Love So Well. 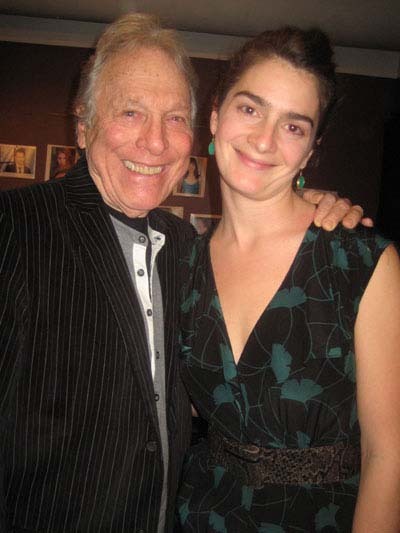 He sang, played selections at the piano, showed videos and told anecdotes. His wife Geraldine Branagan joined him for some songs in the second half of a very pleasant evening. 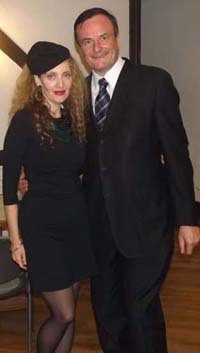 The opening night party took place at the magnificent Residence of the Consul General of Ireland. The New York Gilbert & Sullivan Players presented a rarely performed The Sorcerer, by Gilbert and Sullivan, in a delightful production. The cast was excellent, the staging superb and the orchestra, under the direction of Albert Bergeret, played the tuneful score magnificently. Of the cast, Stephen O'Brien was fine in the title role, Kimilee Bryant was an appealing heroine and Daniel Greenwood an ardent lover. It was a splendid evening. The 24th Gypsy of the Year was a grand occasion, as usual, full of great dancing talent. It was a really delightful program, with the final selection honoring Fred Ebb, with stars like David Hyde Pierce and Debra Monk from Curtains and members of the cast from Chicago. 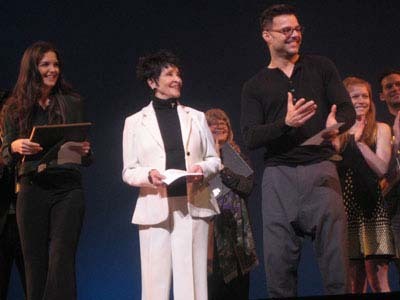 Chita Rivera, Katie Holmes and Ricky Martin presented the awards. Ballet in Cinema from Emerging Pictures presented the 1862 ballet The Pharaoh's Daughter, by the Bolshoi Ballet, recreated by Pierre Lacotte in 2000, and presented in a live performance on November 25. It starred a stunning Svetlana Zakharova in the title role and Ruslan Skyortsov as the English Lord. Both danced magnificently, as did the rest of the company in this elegant and sumptuous production, with gorgeous costumes and sets. The orchestra played the score wonderfully, under the baton of Pavel Klinichev. It was a joy to watch from beginning to end.